On July 26, some 150 supporters of immigrant rights, labor and left groups staged a noisy protest at Ground Zero, the former World Trade Center, in downtown Manhattan against a “press conference” called by the racist vigilantes of the “Minuteman Project.” The anti-racist protesters far outnumbered the handful of Minuteman supporters and in an hour-long face-off kept up a constant barrage of chanting across police barriers. At the end there was a brief jostle as demonstrators crossed the street to get to where the immigrant-bashers were staging their event. For the racist Minuteman vigilantes to hold a race-hate event in New York City, where a large majority of the people are members of ethnic minorities and immigrant families make up over 40 percent of the population, was an outrageous provocation and threat. A call to protest the Minutemen was first issued by the May 1 Coalition. 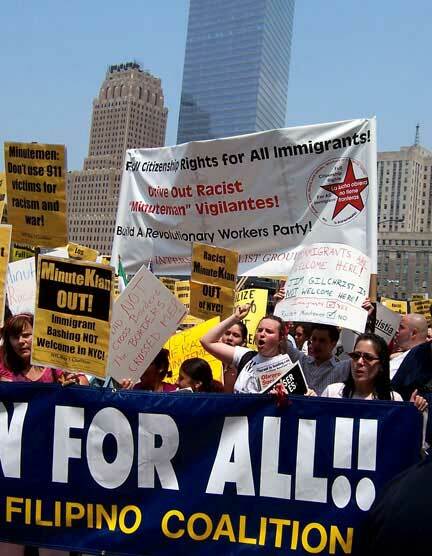 The Coalition name refers to the May Day protest for immigrant rights that as part of a nationwide call brought out several hundred thousand marchers in New York. 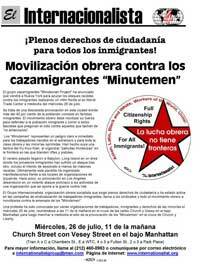 The Internationalist Group issued its own leaflet calling for full citizenship rights for all immigrants and to “Mobilize Labor Against ‘Minutemen’ Vigilantes” (see below). “The workers movement should mobilize its power to defend the immigrant population and run these nativist fascists out of town,” the IG call said. In the week and a half leading up to the protest, the IG approached a number of unions and immigrant labor groups as well as leafleting an SEIU Local 1199 meeting and key subway barns and workshops. At the head of the march was a banner of the Justice 4 Immigrants Filipino Coalition calling for “Legalization for All.” May 1 Coalition signs declared: “MinuteKlan Out! Immigrant Bashing Not Welcome in NYC.” The banner of the Internationalist Group proclaimed: “Full Citizenship Rights for All Immigrants! Drive Out Racist ‘Minuteman’ Vigilantes! Build a Revolutionary Workers Party!” An IG sign made the link between imperialist war and attacks on immigrants, declaring: “Defeat U.S. Imperialist War on Iraq, Bosses’ War on Immigrants.” An IG leaflet explained that the Minutemen seek to provoke police repression against immigrants and leftists as occurred earlier this month in Los Angeles. In a classic example of reformist sectarianism, the “No One Is Illegal Coalition” run by the International Socialist Organization called a separate press conference at a different location three blocks away, discouraging people from going to the meeting place of the competing May 1 Coalition, led by the Workers World Party and its International Action Center. When they arrived at the site opposite the Minutemen, ISOers chanted for “amnesty now.” In sharp contrast to this plea for the government to pardon workers for the supposed crime of being here without “papers,” the IG chanted for “full citizenship rights for all immigrants.” While the ISO and WWP joined in the popular-front slogan, “The people united will never be defeated,” the IG chanted: “Democrats, Republicans, racist parties of imperialist war.” Several left groups, including the Spartacist League and Revolutionary Communist Party, only sent newspaper salesmen. The “Minutemen” obscenely sought to exploit the setting of the September 11 attacks to denounce “illegal immigrants” as potential “terrorists,” just as the U.S. government uses “9-11” as a battle cry for its “war on terror” that seeks to terrorize the world into submission. 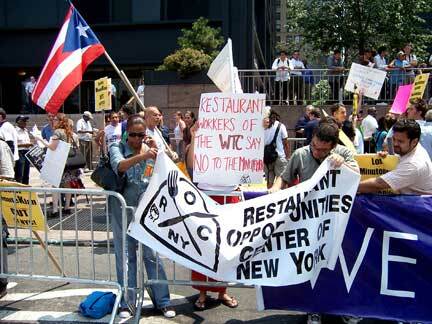 A poignant note was added toward the end of the protest with the arrival, at the invitation of the IG, of several immigrant workers from the Restaurant Opportunities Center of New York with a sign saying, “Restaurant Workers of the WTC Say No to the Minutemen.” A number of their fellow union workers at the Windows on the World restaurant atop the World Trade Center were killed in the September 2001 attacks. And as every New Yorker knows, the majority of restaurant, deli and greengrocer workers – not to mention taxi drivers, much of construction, and innumerable other sectors of the city’s workforce – are immigrants, “documented” and otherwise. For Militant Workers Defense Against Nativist Fascist Immigrant-Bashers! Full Citizenship Rights for All Immigrants! Forge a Revolutionary Workers Party! Jim Gilchrist, co-founder of the “Minutemen,” is coming to Ground Zero in New York City to promote his new book, subtitled “The Battle to Secure America’s Borders,” which purports to be a “how to” manual on organizing violent racist hate groups. Gilchrist wants to spew out his anti-immigrant hate-mongering by using the September 11 (2001) attack on the World Trade Center, in which many immigrant workers died. In the same way, the United States government has used “9-11” as a battle cry for its “war on terror,” launching an imperialist war on Afghanistan and then Iraq in an attempt to terrorize the world into submission to the U.S. diktat. The publication of an idiot’s guide to racist vigilantism is one more gimmick by an outfit that has focused on publicity-grabbing stunts to market its xenophobic (anti-foreigner) message. Gilchrist runs for Congress in Orange County, California, speaks at the National Press Club in Washington and is interviewed by “Lou Dobbs Tonight” on CNN, while Minuteman co-leader Chris Simcox appears frequently on the Fox News show “Hannity & Colmes” in order to gain a “respectable” image for their immigrant-bashing. The media portray their antics as “citizen activism” and “volunteerism,” as if they were collecting money for United Fund charities or a blood drive. But this is just a mask, like Louisiana KKKer David Duke who exchanged his white hood and robes for a suit and tie to run for office in a “white flight” suburb of New Orleans. But “Klan in a suit” Duke and “Minuteman” Gilchrist are sinister figures. What the media don’t report is how the Minutemen and related vigilante groups are infested with Nazis, Klansmen, long-time white supremacist militia men, etc. Gilchrist ally Barbara Coe, head of the California Coalition for Immigration Reform, belongs to the Council of Conservative Citizens, remnants of the White Citizens Councils that terrorized blacks and murdered civil rights workers in Mississippi and Alabama in the 1950s and ’60s. Lately, the Minutemen and their various fronts have been lurking in front of offices of left groups around the country, such as outside Revolution Books in New York, and even outside the Manhattan office of Democratic war hawk Hillary Clinton, champion of militarizing the Mexican border. In Los Angeles on July 8, some 250 “Minutemen” managed to trigger a vicious assault on leftist counterdemonstrators by paramilitary L.A. cops. As the racists taunted “commies” and supporters of MEChA (Movimiento Estudiantil Chicano de Aztlán), police dragged out leftist demonstrators, repeatedly kicking them in the kidneys, beating them on the head with riot sticks and pistol-whipping a young white woman. The Minuteman carried a gloating video of this on their website. Mobilize Labor Against “Minutemen” Vigilantes! The "Minuteman Project" has announced that they are coming to New York City to trumpet their call for racist immigrant-bashing at Ground Zero (World Trade Center) at noon on Wednesday, July 26. This is a blatant provocation in a city where over 40 percent of the population consists of immigrant families. The workers movement should mobilize its power to defend the immigrant population and run these nativist fascists out of town. The “Minutemen” are a clear and present danger to foreign-born workers and to all working people and minorities. Adopting a tactic used by the Ku Klux Klan, they have been staging military-style "border patrols" along the Mexican border with vigilantes brandishing rifles and pistols. Last summer they came to Babylon, Long Island in an area where immigrant day laborers have been repeatedly subject to attack and even attempted murder by racist thugs. Lately this outfit has been going around the country demonstrating in front of left groups’ offices. In Los Angeles it recently led to a vicious police beating of activists of an antiwar group. 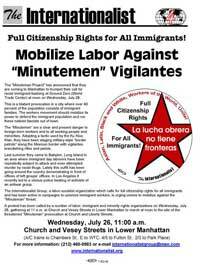 The Internationalist Group, a labor-socialist organization which calls for full citizenship rights for all immigrants and has been active in campaigns to unionize immigrant workers, is urging unions to mobilize against the "Minuteman" threat. A protest has been called by a number of labor, immigrant and minority rights organizations on Wednesday, July 26, gathering at 11 a.m. at Church and Vesey Streets in Lower Manhattan to march at noon to the site of the threatened “Minuteman” provocation at Church and Liberty Streets.